Subject: ORDER OF FUND RELEASE!!! Oceanic bank international plc,Dakar Senegal . Following the instruction we received from Partner(Miss Endurance Azamgo Robert) for the transfer of her late father's outstanding balance in our bank into your account, After our due verification in refference to the request for the release of outstanding balance worth of ($6,500,000.00)belonging to late (Prince Azamgo Robert) Willed to (Miss Endurance Azamgo Robert) presently in our bank here in Dakar Senegal. We have acknowledge the receipt of an authorisation letter from beneficiary (Miss Endurance Azamgo Robert),stating the transfer of the funds be made into your account enline to the mail inquiry in respect to the said inherited fund deposited in our escrow account. Be informed that your formal inquiry has been noted and forwarded to the transfer unit, As we were notify by the medias about the death of the original depositor of the fund in our bank,in person of late (Prince Azamgo Robert),you are hereby required to provide the proof confirming the true death of the depositor and the legality of your claims from the side of the next of kin(Miss Endurance Azamgo Robert)to enable us process the release order,you should present the following documents to this office for the contents to be viewed properly. 1. 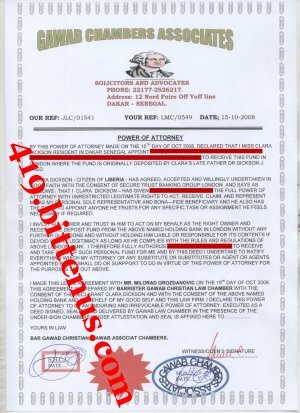 You should present an authority letter(Power of attorney)duly signed by a Senegalais based lawyer as your witness,mandating you to make this claims and transfer on (Miss Endurance Azamgo Robert)behalf. 2. 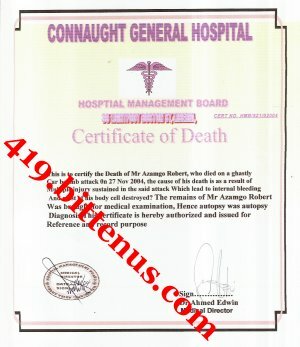 You should present a copy of(Prince Azamgo Robert) death certificate,issued by a public/General hospital confirming his death. 4. You should present to us the last Statement of the account holder (Prince Azamgo Robert). On receipts of the above documents/informations, with satisfaction,we shall process your claim and effect the transfer. Subject: Honey The Lawyer Is The Solution! Good afternoon my love and i'm so pleased to write to you know, i have ran short of words in expressing my heartfelt joy in consideration to your indefatigable efforts in restoring smile and happiness back to my life. I am longing desperately to the day i will see you one-on-one so that i will showcase all my appreciations with the love of my heart. May God continually keep and guide you in all your endeavors. Meanwhile the two letters i forwarded to you are the letters i received from the bank which i discovered that they sent you copies of them, i will like you to contact them with your account information ok! I have gone through the mails we received from the bank and i do really thank God that the bank has responded regarding the account and on a way forward towards achieving a successful transfer. Regarding the documents that the bank required, i have only the Death Certificate and the Statement of Account with me, here is the attached. I have detailed the Reverend Father about the situation of things, regarding the required documents, he has given me a contact of a Reputable Senior Advocate of the Federation who will help us to process the said documents and every other legal support we might need as fast as possible, please my dear co-operate with him. Bellow here is the lawyer's contact i got through the Reverend father in camp. Phone + 221 773 761 484. This lawyer will help us to get the required items and the lawyer will also draft the transfer application for us and support from the Federal High Court here in Senegal. Please keep this matter strictly confidential, I can always trust you, because I don't want my step-mother to know about this on any account, she is after my life. As you can see that we are almost at the end of this matter, God will help us. Now there is no need for us to keep waiting since the bank are ready to make this transfer once the documents are ready, I have ask the Rev.Father here concerning on how i can start preparing my traveling papers. Please my love, I will like you to make contact with this law firm immediately upon your return and ask them to help us to get those needed document for us to enable you send them to the bank for the wire transfer of the money into your account , as you can see that everything concerning this transfer is complete, please help me out to see that this lawyer get this documents within. My prayers are with you and I know that God will surely see us true. Send the letters we received from the bank to the lawyer for his more understanding. I will never forget you in my life, God bless you for me, waiting to hearing from you with the response from the lawyer,please call the lawyer on the telephone so that he will know our seriousness ok at the same time send also an email. It shall be well with us. Remember to send the letter we received from the bank to the lawyer for his more understanding of what we needed him to do ok. I will be glad to hearing from you soonest. Take very good care of yourself and many deep kisses enclosed. I love you incomparably. We hereby bringing to your notice that the required documents (Power of Attorney & Affidavit of Oath) alongwith the Death Certificate and Statement of Account which was brought to my law firm by your partner's Ms. Rita Mpka and ms clara Dickson has been sent to the following banks Reliance Bank and Secure Trust Bank all in London, this afternoon via speed post. We were informed that the package will reach the banks within three working days. Attached here is the scan copy of the power of attorney and affidavit of oath for your documentation purposes. We thank you for chosen us, and we promised to give our clients the best of our services. we wish good luck. Subject: I Did Not Forget Your Past Effort! there is every reason for people like you to be happy. behalf to receive that money. draft to you without delay. I have been instructed to send to you a certified bank draft bearing US$300,000.00, Bank draft is not deduct able transfer able until get's to the care of the beneficiary, you can only receive it by allowing me to send it to you through a courrier service firm from here. Ihave confirm from a reliable courier agency on how they can deliver this bank draft (Cashier's cheque) to your place as you asked me but you will need to urgently re-confirm to me your real full names, current direct telephone numbers and current contact address which you would like to receive the draft from the courrier firm to avoid unwarranted mistakes because the was issued in draft-form for your safety. I'm pregnant and haven't been feeling fine for some days now. You should remember that a bank draft cannot be transfered because it was not issued on my name, it was issued to your name as the beneficiary of the draft and the person who issued this draft is gone so i won't be able transfer it through bank from here but can easily send this draft to you by courrier service means. That's the simple truth ok. I honestly want to beleive that you won't doubt my report because i wouldn't like a situation where-by you will feel that someone is trying a fraud because your expartner did not leave any cash money behind for me to handle the delivery, I'm sure both of you must have discussed about it earlier. Actually i don't have money at hand to help you on the courrier charge, my monthly salary is poor, i am just an ordinary secretary otherwise i would have assisted you to post this draft with my own money so that you will refund me later but i don't have it at the moment. Honestly your money is in a certified bank draft bearing $300,000.00 which cannot be deducted or added untill you present it to your bank with your proved identity. If you are still indoubt, you can re-confirm from your local bank, Please do not take me for deceit. There are relaible courrier service firm nearest to my office here, presently the only way i can assist you is by sending this bank draft to you through courier firm as i mentioned earlier so that you can receive it within 4days and then take it to your bank for melting into your account. The TNT courrier which i consulted over here agreed to deliver the draft to you within 4days but insisted that we must fulfill their service charge of $380 USD equivalent for our local post office in Dakar has been grounded for long and neglected by our government due to corruptions, so it's no longer in use and citizens had no choice than to start using the express courriers for safety, like tnt which is the most efficient in our country. Please use this name stated bellow to send me the money through western union money transfer, send it with my name which i listed below to you send the money to me, so that i can collect the money from western union is $380 USD equivalent to our local currency. Then forward me this 3 information so that i can cash the money over here. I shall get back to you as soon as i receive this information from you and i will scan the copy of the courrier airway bill and send to you, i want you to see their veiws before the draft arrives. Its my great joy to acknowledge your appreciation towards my little gesture to you! Surely it really hurts me that we couldn't make it to be together just as i've wished but i want to tell you that you everly occupied a greater space in my heart more than anyone in my life now unless time will prove it otherwise in the nearest future. I have gone through your conversation with Mrs. Rita, please do comply with her ok, please be fast about collecting the draft from her cos she will soon put to bed. I don't want stories though i trust her. I will try and call you soon ok but for now i'm very busy both in securing an istitution for my studies and for the investment. Keep me posted upon receiving the draft from her. My regards to your family and tell them that i love them all and will definitely see them someday. God bless you and lots of love. Subject: I'm not happy with you. Greetings and how are you doing today! I would want to believe that you're doing great. Anyway i'm in receipt of your email which the content was well understood, wait a minute...should i consider it that you're ungrateful or what? I gave you that gift out of my goodwill and in respect to the joy and words of encouragement you gave me while i was in Senegal though you failed to live up the the expectation i imposed on you, that's by the way. I never believed that you could even asked for my assistance to met up with the courier service charges in conveying the draft to you cos i thought you will be grateful enough and carter for it as your own sacrifice towards my good deed. I have played my own part in reciprocating the good gestures you shown to me and i expect you to be grateful and responsible enough to use it judiciously. However you're my best friend and will forever remain same, i wouldn't mind to have assisted you on the balance if it were within my reach but my hands are tied based on the fact that my husband traveled and the little money i collected from him for my upkeep could not meet up with your demand. Please do bear with me ok. Meanwhile i will like you to try as much as you could to send the balance of the courier service fee to Mrs. Rita as quickly as possible so that she could proceed in sending the draft to you. Even if you have to borrow it, i suggest you do that fast. Remember i told you that Mrs. Rita is pregnant and will soon put to bed, i wouldn't be happy if you abandon the draft with her. Take care of yourself and reply urgently. God bless you. Subject: Re: I'm not happy with you. HAVE YOU COLLECTED THE DRAFT FROM MRS. RITA? I AM REALLY DISAPPOINTED AT YOU. IF YOU'RE NOT WILLING TO HAVE THE DRAFT PLS INFORM ME. MAYBE I CAN SEE WHAT I CAN DO TO DISBURSE THE MONEY TO LESS PRIVILEGED HOMES.